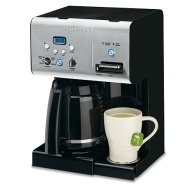 alaTest has collected and analyzed 71 reviews of Cuisinart CHW-12. The average rating for this product is 4.5/5, compared to an average rating of 4.4/5 for other products in the same category for all reviews. People are impressed by the durability and maintenance. The size and design also get good views. There are some negative opinions about the noise. We analyzed user and expert ratings, product age and more factors. Compared to other products in the same category the Cuisinart CHW-12 is awarded an overall alaScore™ of 84/100 = Very good quality. I got this as a house warming present. Was delighted with the item very good. I love this coffee brewer so far. Hopefully it will last. This product is great my only concern is the water heater part gets warm but not hot I wish it had an adjustable temperature. Otherwise makes great coffee and looks good in my kitchen.